I am getting absolutely over the moon every time I hear ‘Christmas time in London’ – there’s nothing like the twinkle of London Christmas lights to give the city an instant festive makeover. I am not getting overly excited about the fact I get to spend some time on gift shopping and eat all the delicious fattening food, but mainly because of the opportunity to once again see the fairy tale lights. It might seem vain, which I am aware of , but on the other hand Christmas decorations are all made for people to admire. After so many years of living in London I managed to create my ‘Christmas to-do’ list, and I try to tick everything off every year. This is not going to be a regular post ‘my findings’ article, but a shared post with my dearest friend, Dominika of The Blonde Flamingo. Southbank Centre is a glorious place to be at Christmas, so make sure you pay a visit to this London institution over the festive period. The market features Nordic-inspired wooden chalets filled with festive food, drinks, gifts and treats for all. I don’t think something will ever beat the view over the Thames (no New Yorks can compete with it!). 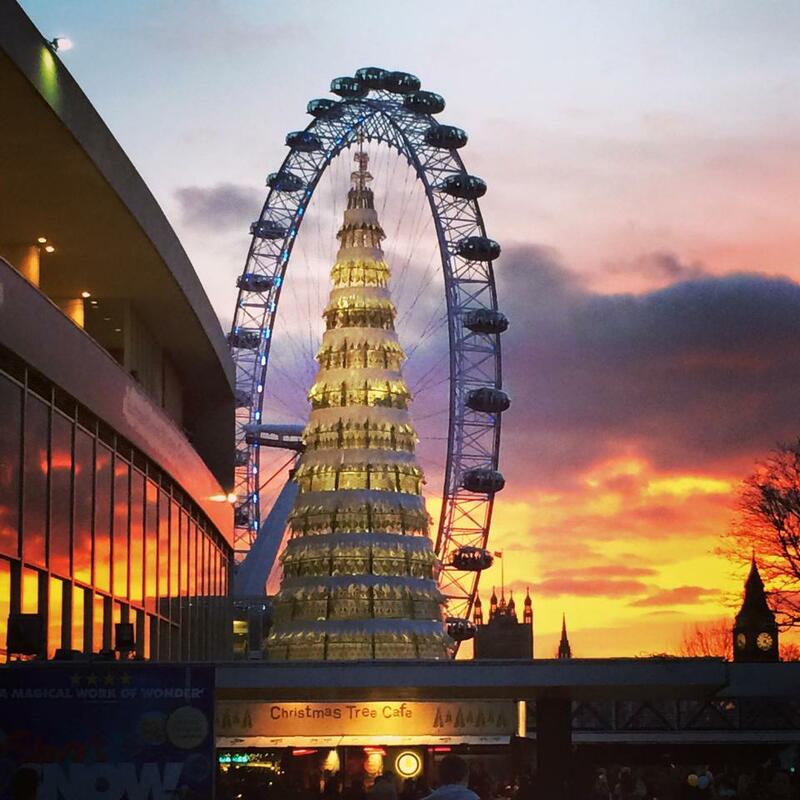 The music, the view, the Christmas market… even the stormy weather won’t be able to ruin it! The whole Covent Garden square has got so much charm in it, but its cobbled piazza and market buildings are especially irresistible at this time of year.! The square holds the most beautiful and spectacular Christmas tree in town. Apart from giant bubbles, the decorations bring back a mistletoe theme for 2017, with over 40 mistletoe chandeliers hanging over the area’s streets and in the pretty market buildings. 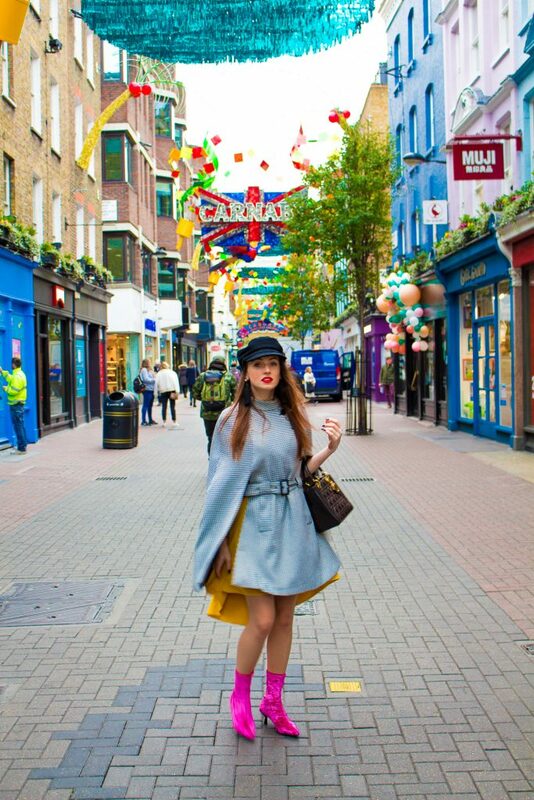 The oh-so-fashionable Carnaby Street! Only a stone’s throw from Covent Garden, this narrow street is one of the fanciest and definitely most distinctive in town! 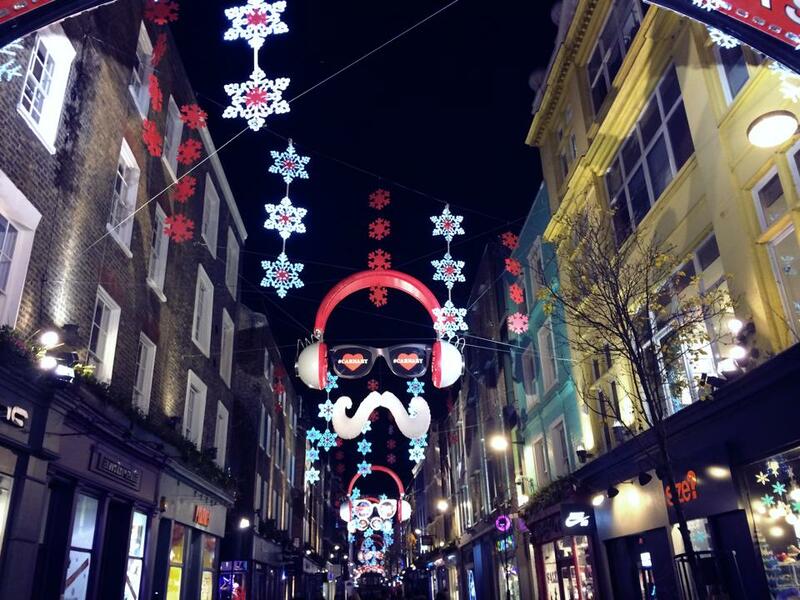 Unlike the rest of London’s streets, Carnaby Street’s ornaments change every season. This year it is styled to be the sort of ‘festive Hawaii’. 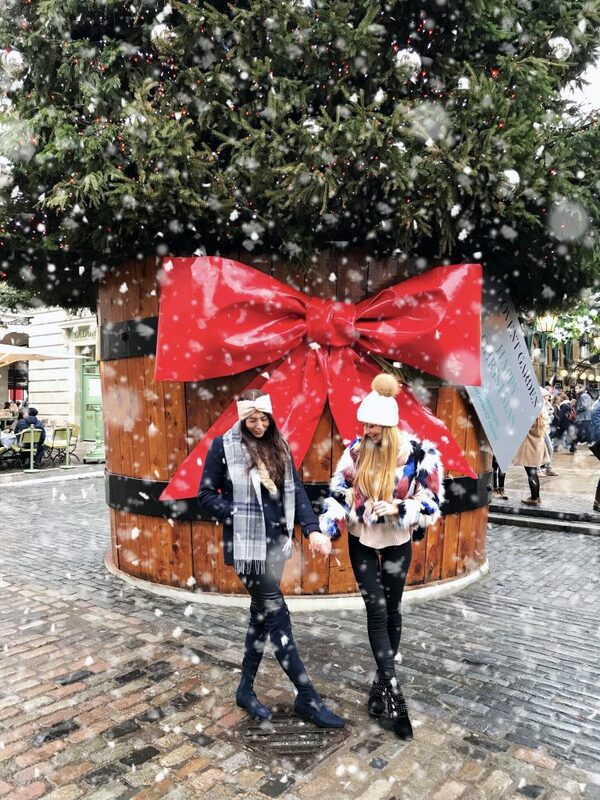 Carnaby is a perfect destination for some last minute Christmas shopping, with all the lovely window dressing of the most prestigious shops, such as Skinnydip, Brandy Melville, Jack Wills, OFFICE, Replay, Scotch & Soda, The North Face, Benefit, Cowshed, Pixie. 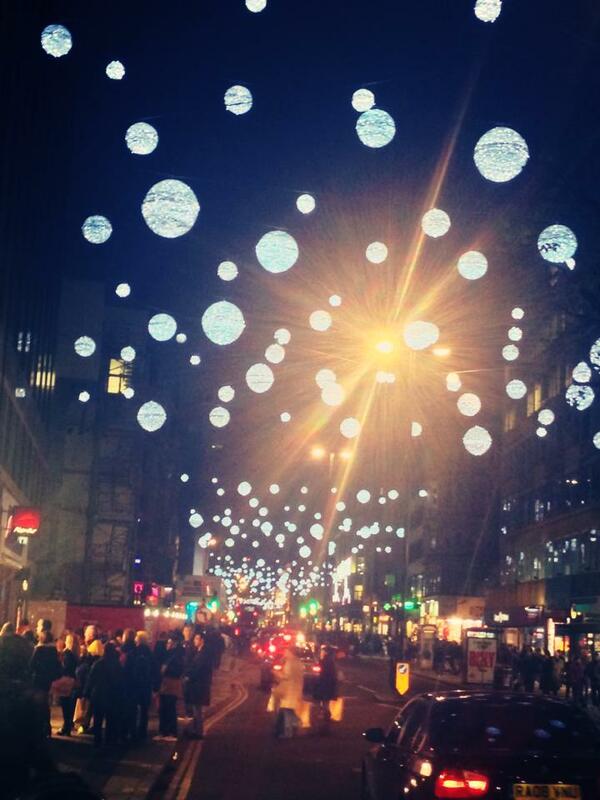 You know Christmas is coming when Oxford Street is transformed by sparkly, glowing lights. 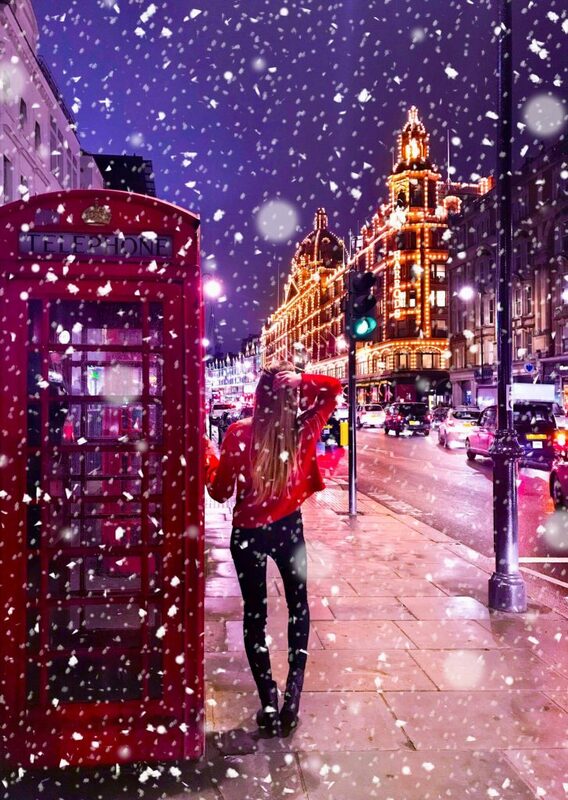 Ain’t no London without Oxford Street 🙂 Did you know it’s fake snowing between the Debenhams and John Lewis? And that there will be 1,778 decorations (and 750,000 LED lightbulbs) inspired by falling snowflakes? Definitely one of the most photogenic and spectacular ornaments you would be able to see in your life. As for the majestic Regent Street – the guarding angels deserve a glimpse! 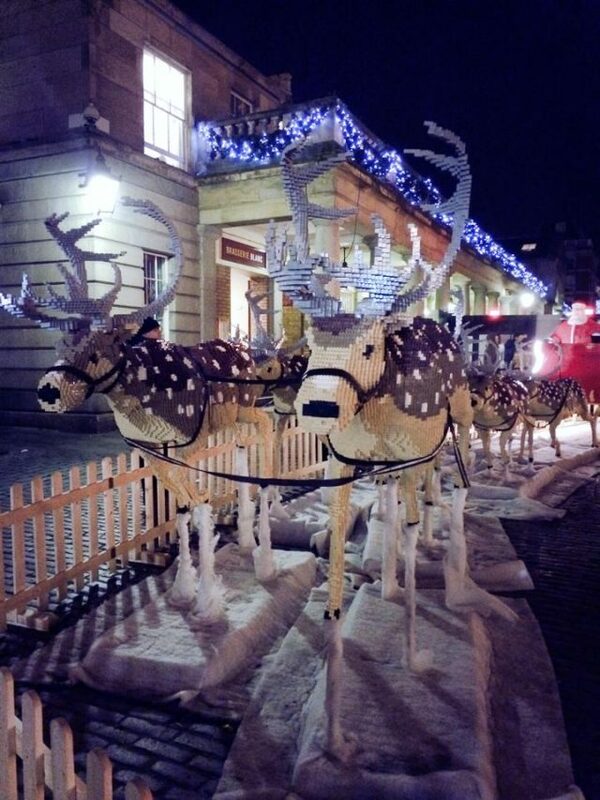 The most luxurious street in London has the most luxurious Christmas lighting. Giant illuminated peacock feathers will line the shopping destination. 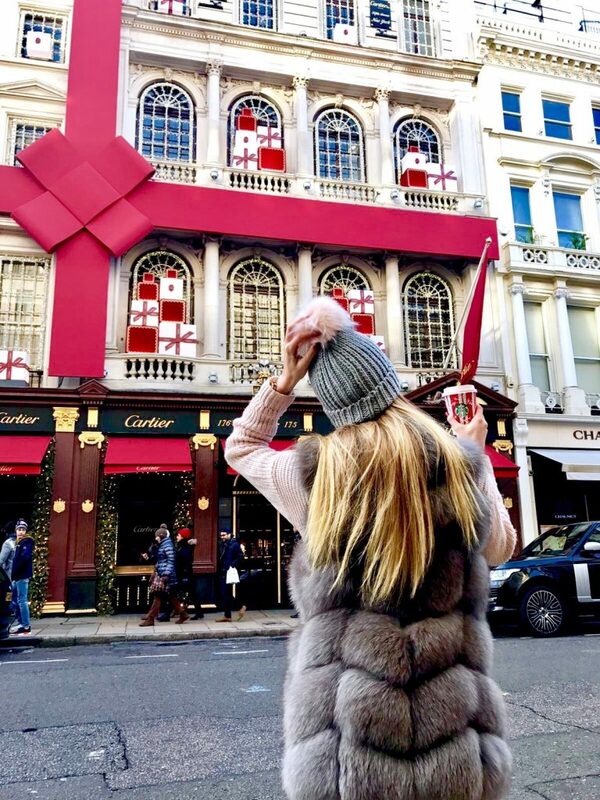 The whole New Bond Street looks even more rich and glam during Christmas. It just makes you wanna stop every two steps to take photos. The most spectacular window dressing? 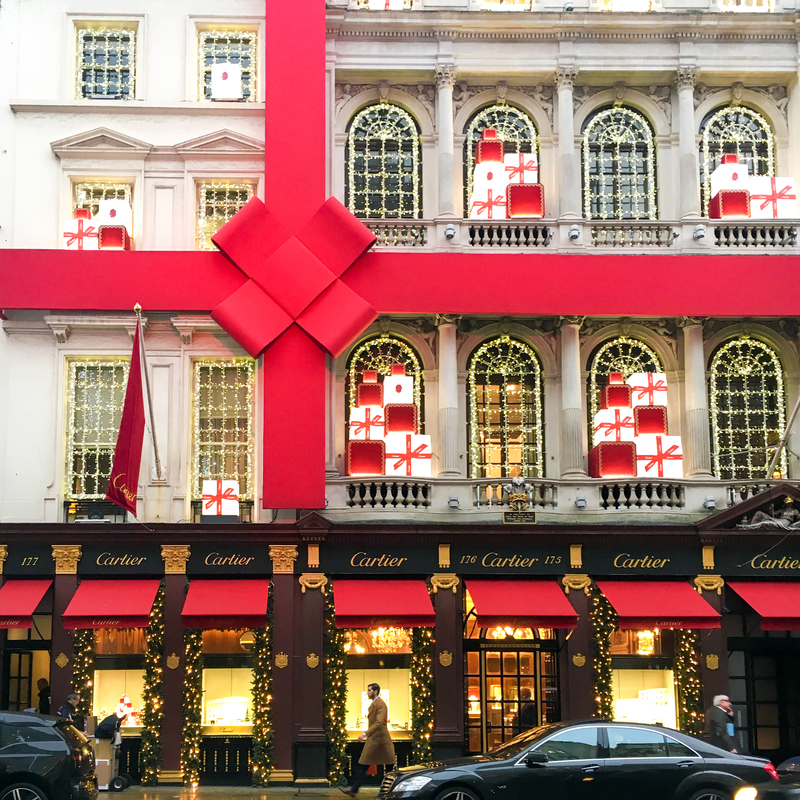 (If you can call it a ‘window’) – Cartier’s ribbon-wrapped flagship boutique! While the theatrical display is now a Christmas tradition, the fine jeweller continues to surprise with its ornate window décor. 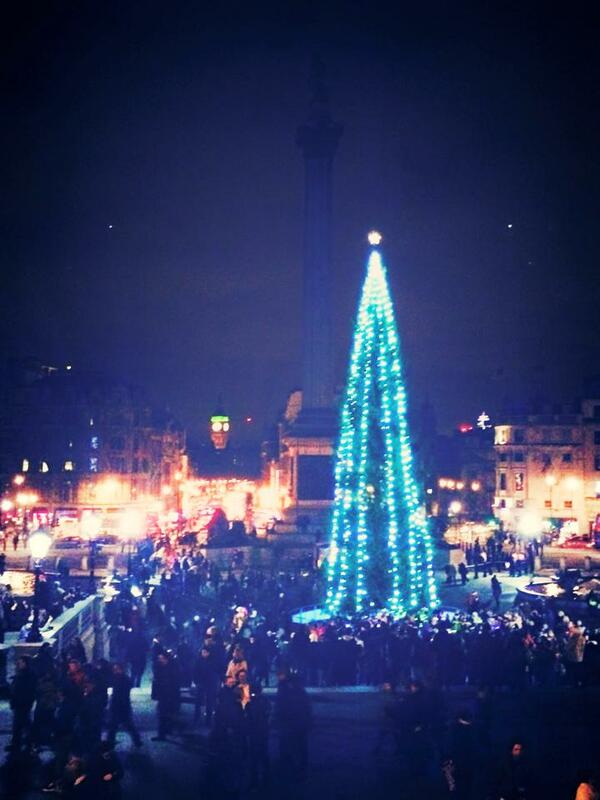 It’s the prettiest Christmas tree in town, but it has a symbolic meaning – The Trafalgar Square Christmas tree has been an annual gift to the people of Britain by the city of Oslo as a ‘token of gratitude’ for British support to Norway during the Second World War. Now it is a place of the Trafalgar Square traditional carol-singing programme, where you can spot quite a lot of people in December and feel the vibe of Christmas. Trafalgar Square is named ‘the heart of London’ for a good reason. So lively, so historical, so majestic – and with the view of Big Ben. This picture was taken back in 2014. Harrods looks festive all year round, so how could you skip it in December? After all, it is a signature building of the United Kingdom. This year the luxurious Christmas window display was designed by the Italian duo Dolce & Gabbana, which is said to be one of the most interesting ones in the history of Harrods. The windows are designed in the style of a Sicilian puppet theatre, with Dolce and Gabbana appearing in marionette forms, ‘telling’ the story of a store. Peggy Porschen Cakes is a chic bakery featuring creative cupcakes, fancy cakes and other sweet treats, plus tea and champagne. 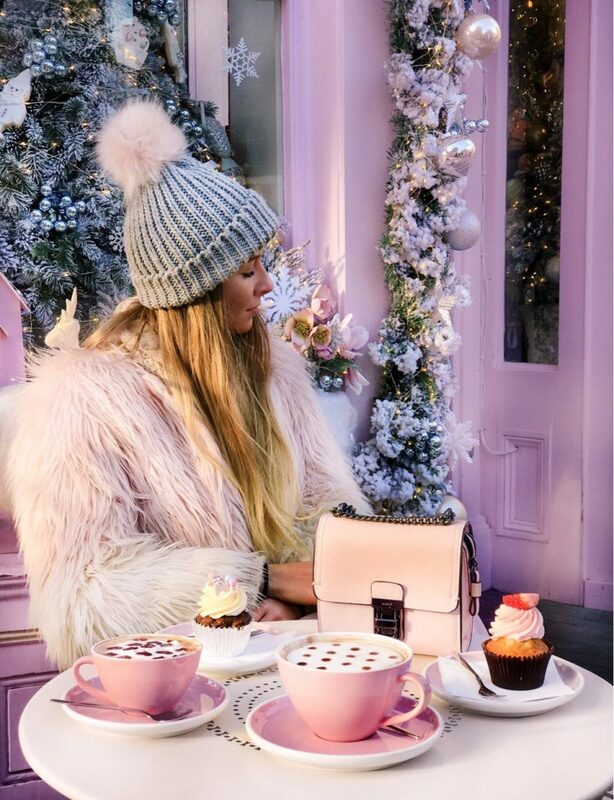 It looks lovely for the whole year round, but Christmas… We could not miss the most instagrammable place in London from our list! It looks so beautiful – definitely worth one hour queue! You can also choose from the whole variety of Christmas cakes and beverages. Wow! It looks like an absolute wonderland! And what’s better than Cartier wrapped in a giant red bow?? Swoon! The pics looks so cool!! Such beautiful pictures! London at Christmas is beautiful!